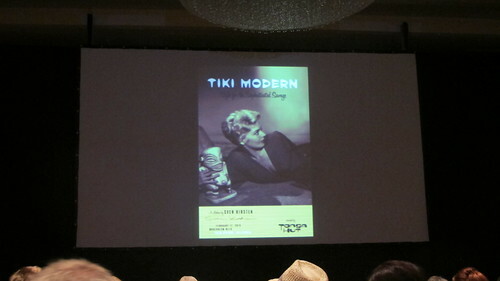 As I mentioned before, there were several tiki related events at Palm Springs Modernism Week this year, including the lecture “Tiki Modern: Style for the Sophisticated Savage” presented by Sven Kirsten, author of The Book of Tiki and Tiki Modern. In order to make the Hilton ballroom look less corporate and a little more tiki, Sven brought along these two carved saloon doors that once adorned the Reef Bar (since closed) at Caliente Tropics (still open) in Palm Springs. 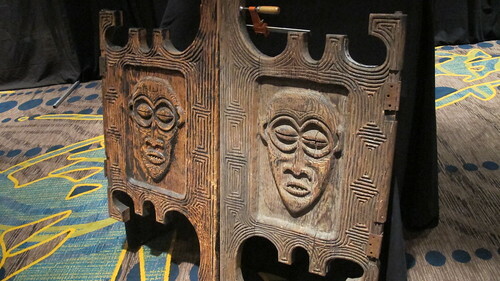 They disappeared 20 years or so ago but were rediscovered recently and will be installed over at Tonga Hut Palm Springs. 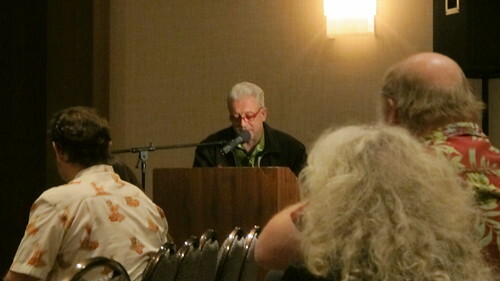 The talk touched on many tiki topics, including Sven’s initial surprise at finding that tiki’s influence in its heyday wasn’t just limited to bars and restaurants but also carried over to apartments, hotels, bowling alleys, etc. (particularly on the West Coast and “recreational states” like Florida and Arizona). Sven also talked a bit about his upcoming “Tiki Pop” exhibition at the Musée du quai Branly this summer. For those of us who won’t be able to jet off to Paris, there will thankfully be a 400-page catalog (with 900 illustrations) published by Taschen that will be available for purchase.